Falcons edge 3-2 Wolves to close out regular season. Sixth inning bunt by Stewart scores winning run. LORANGER, LA—The Saint Thomas Aquinas Falcons closed out the regular season getting back on the winning track with a 3-2 victory over the Loranger High Wolves. The contest was tied at two with the Falcons batting in the top of the sixth when a sacrifice bunt by junior Parker Stewart scored senior Brack Barringer who ran for senior Sam Smith who doubled. Senior Luke Sweeney got the win for Saint Thomas Aquinas. He lasted three and two-thirds innings, allowing two hits and zero runs while striking out one and walking one. Junior Breyer Zahn started the game for Loranger. He lasted five and a third innings, allowing nine hits and three runs while striking out one John Blanchard started the game for Saint Thomas Aquinas. He surrendered two runs on two hits over three and a third innings, striking out three. Smith went 3-for-4 at the plate to lead the Falcons in hits. Blanchard, and senior Ryan Dawsey all had multiple hits as the Falcons collected nine hits. After falling behind 2-1, Saint Thomas Aquinas knotted the game up at two in the top of the fifth inning, when freshman Jordan Trapani singled on a 2-2 count, scoring Sweeney who singled to get on base. The two teams will await the release of the LHSAA Baseball playoff brackets with both teams expected to host a first round game. Falcons rally racking up ten hits to take game one of the three-game series with the Doyle Tigers. HAMMOND, LA—Despite a shaky start in the field with three quick errors and a three-run dinger by Doyle’s Tyson Stewart in the top of the first, the Saint Thomas Aquinas Falcons kept their poise and rallied back to take a 10-5 win in the first of three games with the Tigers to determine the District 9-2A Championship. Tyler Domiano started the Falcons climb back into the game after falling behind 3-0 hitting a triple and then scoring on a passed ball. The Tigers padded their margin in the second adding two more runs to take a 5-1 lead, but Matt Linn singled to score Parker Perriloux to cut to 5-2. Luke Sweeney delivered a sacrifice fly to score Parker Stewart who was hit by a pitch in the third and Sam Smith doubled on a 3-2 count, scoring three runs to give the Falcons the lead. Smith, Stewart, and Artigues all singled in the bottom of the sixth to pad the Falcon lead by three. John Blanchard was credited with the victory for Saint Thomas Aquinas. He lasted seven innings, allowing six hits and five runs while striking out seven. Logan Turner took the loss for Doyle. He went two and two-thirds innings, allowing seven runs on six hits. Smith, Parker Stewart, and Blanchard each collected multiple hits for the Falcons. Mason Davis led Doyle with two hits in three at bats. Falcons collect 20th win on the season as senior Luke Sweeney pitches a perfect game on Senior Night! Junior John Blanchard made the most of two hits notching four RBIs. HAMMOND, LA—Generally nothing is perfect but there is that rare occasion when perfection is realized and for the Saint Thomas Aquinas Falcons Senior Night proved “just perfect” as senior Luke Sweeney pitched a perfect game to defeat French Settlement 11-0. Sweeney surrendered zero runs on zero hits over five innings, striking out seven and walking zero. Sweeney induced a fly out from Edward Allison to end the game. Brice Fruge took the loss for French Settlement. He allowed eight hits and ten runs over three innings, striking out one and walking one. Junior John Blanchard got the party at the plate started in the bottom of the first smacking a triple to score three runs. He would finish with a pair of hits and four RBIs. Senior Sam Smith and Ryan Dawsey each added two hits and the Falcons were sure-handed in the field and didn't commit a single error. Smith had the most chances in the field with seven. Saint Thomas will finish up their three-game series with French Settlement Friday on the road. Falcons find their stroke at the plate and ten-run rule Springfield 12-2. Falcons collect ten hits including five doubles. HAMMOND, LA—Round two of the three-game district series between the Saint Thomas Aquinas Falcons and the Springfield Bulldogs started much like the first game that ended 1-0 with the Falcons getting the win. Saint Thomas scored one run in the bottom of the first on a double by junior Parker Stewart and Springfield answered in the top of the second with two runs cashing in a walk and a Falcon error. But the nail-bitter ended quickly in the bottom of the third as Saint Thomas plated six runs on seven hits to take the lead and break open a close game en route to a 12-2 win. Saint Thomas took the lead for good with six runs in the third inning. In the third Stewart singled on a 1-1 count, scoring two runs, John Blanchard doubled on a 1-0 count, scoring two runs, Jordan Trapani singled on a 1-2 count, scoring one run, and Matt Linn singled on a 2-0 count, scoring one run. Stewart led the hit parade with single and a double and three RBIs and Blanchard made the most of a double collecting three RBIs as well. Seniors Sam Smith and Luke Sweeney each added a pair of hits. Junior Collin Hayden led Springfield with a pair of hits with Trent Fisher and Blake Lobell each adding a single. Sweeney got the win for the Falcons working five innings, fanning six, walking five, and giving up two runs. Lobell took the loss for Springfield. He allowed seven hits and seven runs over two and two-thirds innings, striking out two and walking zero. Falcons win a pitching duel with rival Springfield to open District play as Blanchard goes seven on the bump for the win and Stewart singles to score the winning run. HAMMOND, LA—It was just opening day for District play and the Falcons and Bulldogs played a classic with Saint Thomas winning a pitching duel 1-0 over Springfield. A pair of right-handed juniors backed up by some solid defense put on a defensive show as John Blanchard outlasted Springfield’s Collin Hayden to get the win. Blanchard allowed one hit and zero runs over seven innings, striking out three, while Hayden allowed one run on one hit, striking out four and walking one. Junior Parker Stewart provided the heroics for the Falcons at the plate smacking a single in the bottom of the sixth to score senior Brock Barringer who ran for senior Sam Smith who was hit by a pitch. Trapani’s walk-off seals Falcons victory over Opelousas Catholic! Senior Blair Rodrigue was the winning pitcher surrendering zero runs on two hits over two innings, striking out one and walking zero. Senior Luke Sweeney went yard in the sixth inning. HAMMOND, LA—The Falcons played their twentieth game of the season on head coach Barrett Morgan’s birthday and his charges did not disappoint in getting him a gift as they rallied from three runs down to defeat eighth-ranked Opelousas Catholic 4-3 in dramatic fashion. A walk-off walk by freshman Jordan Trapani propelled the Falcons to a victory over the Vikings. The game was tied at three with Saint Thomas Aquinas batting in the bottom of the eighth inning when Trapani drew a walk, scoring one run. The victory improved the Falcons season mark to 15-5 with district play starting next week. Opelousas Catholic got things moving in the first inning. Zack Mengareut drove in one when he singled. Opelousas Catholic added runs in the third and fourth innings before the Falcons rallied with two runs in the bottom of the fifth. Matt Linn walked to start the fifth followed by singles by senior Sam Smith and junior Tyler Domiano and a sacrifice by junior Parker Stewart. Senior Blair Rodrigue was the winning pitcher surrendering zero runs on two hits over two innings, striking out one and walking zero. Cameron Gautrie started the game for Opelousas Catholic. He went seven innings, allowing three runs on four hits and striking out six John Blanchard started the game for Saint Thomas Aquinas. He allowed seven hits and three runs over six innings, striking out four and walking one. Stewart walked to start the Falcon heroics in the bottom of the eighth. Senior Brock Barringer ran for Stewart advancing to second on a single by sophomore Casey Artigues. Sweeney was next hitting deep fly ball to left enabling Barringer to tag up and advance to third. Blanchard followed working the count for a walk to load the bases. Trapani finished the rally for the Falcons earning a walk and the winning RBI. Domiano, Sweeney, Stewart, Artigues, and Smith each collected one hit to lead the Falcons. Saint Thomas Aquinas was sure-handed in the field and did not commit a single error. Domiano had the most chances in the field with eight. The Falcons play Albany on Saturday and then start District play next week with a three-game series against Springfield. Senior Ryan Dawsey delivered a walk-off single Saturday in the third game in two days with 5A C.E.Byrd to take game three 5-4 and avoid a sweep by the Jackets. HAMMOND, LA—After suffering a pair of setbacks to visiting C.E. Byrd losing 6-0 on Friday and 12-4 in the first game of a double-header on Saturday, the third try was the charm as senior Ryan Dawsey delivered a walk-off single in the bottom of the eighth to give the Falcons a 5-4 win. Freshman Layton Pittman earned the victory on the mound for the Falcons as he surrendered zero runs on zero hits over one inning, walking one. Blair Rodrigue threw two-thirds of an inning in relief out of the bullpen relieving senior Luke Sweeney who allowed five hits and four runs over six and a third innings, striking out three. Saint Thomas Aquinas racked up nine hits in the game with Tyler Domiano and Ethan Alston each nothcing multiple hits. Cole Joyner took the loss for C.E. Byrd. He lasted one and two-thirds innings, allowing two hits and two runs. Borham led C.E. Byrd with two hits in two at bats scoring four runs. Falcons and Wave rumble in a classic rival contest. Rodigue delivered in relief as Falcons rally from a 6-0 deficit to collect an 11-6 win as Blanchard went 3-for-4 at the plate to pace the offense. PONCHATOULA, LA—It was sloppy at times as each team collected four errors and emotions were high as three players were ejected but the annual parish rival contest between Saint Thomas and Ponchatoula was worth the price of the ticket. The Wave built a 6-0 lead only to see the Falcons rally behind a solid pitching performance from senior Blair Rodrigue who pitched three shutout innings to silence the Ponchatoula bats and the Saint Thomas offense responded scoring 11 unanswered runs. The Wave took command of the contest early plating three runs in the third and fourth innings as three errors by the Falcons in the third yielded three runs and Justin Hutches and John Gardner all moved runners across the plate with RBIs in the fourth inning. Ponchatoula starter Collin Babin pitched shutout before having to leave the game going four innings fanning five and walking one. With the contest tied at six in the top of the fifth, junior John Blanchard doubled on a 1-1 count, scoring one run and the rally was on as the Falcons pounded out four hits to take the lead for good with a seven-run inning. The Falcons tallied ten hits. Blanchard, Tyler Domiano, Casey Artigues, and Sam Smith all had multiple hits as Blanchard went 3-for-4 at the plate to lead Saint Thomas. Ponchatoula collected six hits with senior going three-for-three with two double scoring two runs. Rodrigue earned the win fanning two, giving up two hits and walking none in three shutout innings of work. Collin Husser took the loss Ponchatoula. He surrendered seven runs on four hits over two-thirds of an inning, striking out one. Falcons rally with Sweeney dinger and walk-off with Artigues RBI single. Stewart, Rodigue, and Domiano combine to secure the win on the bump. HAMMOND, LA—It was a day for backyard heroes … a solid pitching performance by junior starter Parker Stewart, a dinger by senior Luke Sweeney to tie the contest at four apiece, a shutout inning pitched by senior Lefty Blair Rodrigue in the seventh, another shutout inning pitched this time by junior Tyler Domiano in the top of the eighth, and a hard hit single by sophomore Casey Artigues to walk off with a 5-4 win over East Saint John in the bottom of the eighth scoring Stewart, who tripled to lead off the inning. The heroics by the Falcons helped them overcome two jacks by the Wildcats who led Saint Thomas Aquinas 4-3 heading into the bottom of the seventh. Saint Thomas Aquinas took an early lead in the second inning when senior Ryan Dawsey singled on a 2-0 count, scoring one run, and took a 3-2 lead into the sixth when Herman Farlough sent a two-run jack over the wall to give the Wildcats a 4-3 margin. Saint Thomas Aquinas racked up nine hits on the day. Artigues, Stewart, and Sweeney all collected multiple hits with Artigues leading the way with three hits. Farlough took the loss for the Wildcats working three and two-thirds striking out six and giving up five hits. East Saint John finished with five hits including two home runs. The Falcons are headed for a showdown with 5A parish rival Ponchatoula on Tuesday and Morgan expects another great atmosphere and game as both teams are coming off good weeks with the Wave going 3-0 in the Hammond Tournament including a 4-1 win over Jesuit and the Falcons wining a pair of back-to-back tough games in their tournament. “We like to put our guys into a great atmosphere against quality opponents as these experiences help you to become mentally tougher which you have to be to compete in the playoffs and get to Sulphur,” explained Morgan. The Falcons are 8-2 and the Wave is 8-4 heading into the Tuesday in parish showdown on Tuesday at Ponchatoula with first pitch set for 6:30 p.m. Falcons get back in the win column with 9-5 win over local rival Albany. Junior Parker Stewart collected three hits and Tyler Domiano notched two hits and three RBIs. HAMMOND, LA—The Falcons wasted no time rebounding from a 6-0 setback to Mandeville in the first game of their annual tournament on Thurday as they overcame a solid effort by local rival Albany scoring a 9-5 win to improve to 7-2 on the season. Junior John Blanchard worked five innings fanning seven to earn the win and freshman Layton Pitman closed out the contest pitching two shutout innings fanning three to secure the victory. Blanchard helped himself with double and an RBI. Albany captured the lead in the second inning. Rayborn grounded out, scoring one run. Albany followed up with two runs in the top of the fifth, Saint Thomas Aquinas answered with two of their own. Albany scored when Brock Bankston singled on a 1-2 count, scoring one run and Joey Smith singled on a 1-0 count, scoring one run. The Falcons then answered when Tyler Domiano singled on a 1-2 count, scoring two runs. The Falcons added some insurance notching three runs in the fourth inning. Rayborn took the loss for Albany. He surrendered seven runs on nine hits over four innings, striking out three. Bankston and Donovan Giamalva each had multiple hits for Albany. Falcons return home and continue their winning ways. Falcons improve to 6-1 with 6-3 win over Fountainebleau. HAMMOND, LA—The Saint Thomas Aquinas Falcons rallied from a 2-1 deficit Monday to take down the visiting 5A Fontainebleau Bulldogs 6-3. Junior Parker Stewart got the win worked out of a pair of bases loaded situations striking out seven and giving up three runs. Senior Lefty Blair secured the victory pitching two shutout innings to close the door on Fontainebleau. Tyler Domiano went 2-for-4 at the plate to lead Saint Thomas Aquinas in hits. Junior John provided a key hit collecting two RBIs to add some insurance in the fifth. Stewart helped himself with an RBI single. Will Kinzeler started the game for Fontainebleau. He allowed six hits and two runs over three innings, striking out three and walking zero. Preston Canale led the Bulldogs with two hits and an RBI. Falcons collect a pair of wins at Monroe Tourney. Falcons improve to 5-1 and host Fountainbleau at Austin Brooks Field on Monday. HAMMOND, LA—After stumbling in their first contest in the Trey Altick Monroe Tourney losing to Family Community Christian 3-1, the Saint Thomas Aquinas Falcons rebounded with a pair of solid wins defeating Cedar Creek 7-2 and Kinder 6-2. The weekend of work improved the Falcons mark to 5-1 on the season as they return home to host Fountainbleau at Austin Brooks Field on Monday. Senior Luke Sweeney turned in an impressive performance in the win over Cedar Creek surrendered two runs on four hits over seven innings, striking out 12 and walking one. The Falcons had eight hits in the game. Junior John Blanchard and senior Ryan Dawsey each had multiple hits. Saint Thomas kept their bats working in the win over Kinder notching 10 hits. Blanchard took the win for Saint Thomas Aquinas. He allowed six hits and one run over six innings, striking out four, while senior Blair Rodrigue threw one inning in relief out of the bullpen. Falcons bring the bats and smack the Slidell Tigers 15-2! Alston collects six RBIs on three hits and Stewart goes four and third on the bump for the win. HAMMOND, LA—Sophomore Ethan Alston led a furious offensive show by the Falcons collecting six RBIs on three hits as Saint Thomas Aquinas totaled 13 hits en route to a 15-2 thrashing of the Slidell Tigers in action Tuesday. Senior Parker Stewart was solid on the mound going four and a third to get the win with freshman Layton Pittman recording the final two outs in relief. In the first inning, the Falcons got their offense started when Casey Artigues doubled on a one-two count, scoring two runs. Saint Thomas Aquinas notched seven runs in the third inning sparked by singles by Tyler Domiano and Layton Pittman, a walk by Parker Stewart, a groundout by Luke Sweeney, and a double by Alston. Caleb Waddick took the loss for Slidell. He allowed ten hits and 15 runs over two and two-thirds innings, walking one. The Falcons saw the ball well today, racking up 13 hits in the game. Alston, Artigues, Domiano, Pittman, and Josh Bluain each racked up multiple hits for Saint Thomas Aquinas. Alston went 3-for-4 at the plate to lead the Falcons in hits. Saint Thomas Aquinas did not commit a single error in the field. Domiano had the most chances in the field with ten. Falcons rally for 7-5 win over Salmen. Blanchard hits a dinger and Lefty Blair gets the save. HAMMOND, LA—The Saint Thomas Aquinas Falcons rallied from a 2-0 deficit to score a 7-5 win over the Salmen Spartans in action Friday in the annual Northshore Tournament. Junior John Blanchard provided the fireworks at the plate smacking a two-run dinger to pace a five-run third inning. Junior Luke Sweeney worked five innings in relief of stater junior Tyler Domiano to earn the win. Senior Lefty Blair saved the contest for the Falcons pitching two scoreless innings to close out the game. The Falons will host Slidell at 3 p.m. Saturday. Falcons survive late rally by Hammond. Saint Thomas scores opening day 6-5 win. HAMMOND, LA—The Saint Thomas Aquinas Falcons took a 6-2 lead into the final half of the seventh inning but had to survive a late rally by the Hammond High Tornadoes to secure a 6-5 win. Hammond scored three runs in the failed comeback on a walk by Griffin Tinerello and a double by John Francis. Sam Smith tripled on a 1-0 count, scoring one run to get the Falcon offense started. The Falcons plated two more runs in the second as Parker Stewart and John Blanchard singled. The pair would combine for the win on the mound as Blanchard got the win going five innings and Stewart worked the final two. Matt Latino took the loss for Hammond. He allowed five hits and four runs over four innings, striking out four. Saint Thomas Aquinas tallied nine hits in the game. Stewart went 3-for-4 at the plate to lead the Falcons. Kenny Bell led Hammond with three hits in four at bats. HAMMOND, LA—If Saint Thomas Aquinas head baseball coach Barrett Morgan was like seniors who graduate after four years, he could certainly look back at his four years as the Falcons head coach and know he has built and impressive resume— a record of 108-24, a Class 2A State Title, a Division III State Runner-up Title, two quarterfinal appearances, two national rankings, and three straight 9-0 District 9-2A Titles and sending multiple players to play at the next level. Of course to the delight of Falcon fans Morgan’s tenure is not up after four years and he will be returning for his fifth season. The state of Saint Thomas Aquinas baseball is very good. Personal preparation is one of the real keys that Morgan sees that has made Falcon Baseball a successful program and made it possible to continue to be successful. Players taking responsibility for their own development—doing work on their skills and strength and conditioning long before a formal practice ever starts with him and his coaching staff. “We are also blessed to have some great facilities and are continuing to upgrade. We hope to cover the bleachers this year and are excited about some new uniforms for the guys,” added Morgan. However, with the departure of another group of talented seniors—a group that played during the program’s four-year rise and won 108 games—future success is not guaranteed and the returning players along with an influx of freshmen will have to create their own identity moving forward. Indeed with so many new faces and a number of positions to fill determining the cast of characters that will take the field this season is still a work in progress. “My coaches and I have a lot to do on the drawing board as we work with a lot new faces and try to determine where best they can be effective both in the field and at the plate thus, I have had to be more hands on in our preparation for this season,” said Morgan. “We were very adult and mature as a group last season with some guys that had started for us all four years where this year’s group is more immature and will require more coaching and me putting my thumb on them so to speak,” said Morgan. With the departure of Alex Egan to graduation who was a standout ace for the Falcons and pitched the 2016 state championship game earning MVP honors, the Saint Thomas pitching staff will have some new faces and some returning pitchers that will be expected to step up and play a bigger role in the rotation. At the plate, the Falcons enjoyed one of their best seasons and were even better than the 2016 championship team in terms of plate production. As a team Saint Thomas finished with a .370 average and graduated one of their best clutch hitters in their history in Champ Artigues who is now playing baseball at Louisiana Tech. The Falcons have developed a successful reputation in executing the hit and run and the Falcons were able to average nearly ten runs a game. When it comes to “catching” the Falcons will enter the season with a trio of options including first team All-District senior catcher Sam Smith, Matt Linn, and an up and coming freshman in Trapani. “I always say that the best way to develop a catcher is to keep them catching. They work bull pens all the time and we rotate them in and out in some team drills to get work,” said Morgan. “Again, all the pieces are there,” continued Morgan. “It is just finding the right spot to put the guys in and combinations at the plate. As good as the Falcons were last year, going undefeated in district was not easy and required a few come-from-behind efforts to get wins. District foes Doyle and Springfield gave Saint Thomas all they could handle in a pair of contests threatening their bid for an undefeated league record. Five Saint Thomas Aquinas Falcons honored on the LSWA All-State Team. Champ Artigues and Alex Egan named to first team. BATON ROUGE, LA—The Saint Thomas Aquinas Falcons were well represented on the 2018 Louisiana Sports Writers Association Class 2A All-State Team as Champ Artigues and Alex Egan named to first team, while Brandon Tallo, Luke Sweeney, and Sam Smith received Honorable Mention honors. The Falcons collected 30 wins for the second time in four years and finished this season as the Division III State Runner-up. Falcons earn nine spots on the First Team 9-2A All-District Team. Senior short stop Champ Artigues named District MVP. HAMMOND, LA—With a 9-0 record in District play for the third year in a row, it is fitting that the Falcons would place nine players on this year’s 9-2A All-District first team. Headlining the list is senior Champ Artigues. Artigues while playing short stop collected 43 hits this season including 19 extra base hits finishing with a batting average of .453 and a slugging percentage of .716. Saint Thomas played pitch and catch on the first team list as senior Alex Egan with a 10-1 mark and sophomore John Blanchard with a 5-2 mark earned pitcher honors and junior Sam Smith was named first team catcher. The Falcons dominated the outfield selections as senior Brandon Tallo and senior Kade Bleakley earned first team honors. Tallo was also the Falcons top base stealer with 41. Getting the job done wherever they are needed saw juniors Luke Sweeney and Ryan Dawsey earn first team selection as utility players. Sweeney excelled at the played leading the team in RBIs with 40 while Dawsey finished with a .344 average and a .500 on base percentage. Senior outfielder Jacob Becerra earned second team honors along with freshman Ethan Alston. Becerra posted a .384 batting average collecting 10 extra base hits and 26 RBIs. Alston batted .324 and had 13 stolen bases. Rounding out the list were three Honorable Mention selections as freshman Casey Artigues, junior Bryce Jones and senior Blaine Jacobs all earned honors. Falcons headed back to Sulphur!.. Saint Thomas Aquinas Falcons win game two of their three-game series with Menard 11-1 to advance to the LHSAA Division III Sem--finals. HAMMOND, LA—The Saint Thomas Aquinas Falcons are headed back to Sulphur after an 11-1 five inning rule win over visiting Holy Savior Menard in their Division III LHSAA State Quarterfinal contest at Austin Brooks on Saturday. The victory complete a two-game sweep in the best of three series earning the Falcon a showdown with Dunham in the State Semifinals, the team that eliminated Saint Thomas in the quarterfinals last season. The Falcons took an early 3-1 lead and after an impressive play by senior Champ Artigues to turn a double play and get Saint Thomas out of a bases loaded jam in the bottom of the fourth, the Falcons took charge plating eight runs to put the contest away in the top of the fifth. Junior Luke Sweeney, Artigues, senior Kade Bleakley, senior Brandon Tallo, and junior Sam Smith all moved runners across the plate with RBIs in the inning. “I tell these guys all the time to go play a position that you are not comfortable with and Champ probably had not played first base since he was ten years old. We had him there because he s coming off a shoulder injury and he did a great job fielding a ball that took a weird hop,” added Morgan. Sweeney was the winning pitcher for Saint Thomas Aquinas. He lasted three and a third innings, allowing zero hits and one run while striking out one. Bleakley threw one and two-thirds innings in relief out of the bullpen. Cade Moreau took the loss for Holy Savior Menard. He lasted four innings, allowing eight hits and seven runs while striking out two and walking one. In all, five different pitchers worked in the game with some control issues combining to total eight hit batters, four by each team. Freshman Casey Artigues, and Sweeney led the team in RBIs with each batting in three runs. Smith, Sweeney, Egan, and Becerra all had two hits as the Falcons collected five extra base hits. Egan delivers in his final game pitched at Austin Brooks..
Saint Thomas Aquinas Falcons collect 13 hits as they shutout Menard 8-0! The winner of this three game series will play Dunham who advanced to the Division III Semi-finals with two-game sweep of Calvary Baptist. HAMMOND, LA—Senior ace Alex Egan made the most of his final appearance on the mound at Austin Brooks delivering an 8-0 shutout of the visiting Holy Savior Menard Eagles as the Falcon won game one of the best of three LHSAA State Division III Quarterfinals. “We really ran the bases well tonight—a really fantastic job. That is who we are. When we start putting pressure on teams some throws get forced and we can take advantage,” continued Morgan. Bailey Crowe took the loss for Holy Savior Menard. He surrendered eight runs on 13 hits over six innings, striking out two. ”I thought we prepared really well for their pitcher and except for missing on a couple of bunt tried, the guys responded well at the plate,” added Morgan. Egan led with three hits while Artigues, Luke Sweeney, and Becerra all added two hits and combined for four RBIs. Falcons end regular season with a pair of dingers and a 12-4 win over Loranger..
Saint Thomas Aquinas claims the top spot in the power point rankings. HAMMOND, LA—It was Double Dinger Day at Austin Brooks as the Saint Thomas Aquinas Falcons closed out the regular season with a 12-4 win over the visiting Loranger Wolves in action Saturday. Junior Luke Sweeney hit a two-run dinger in the first and senior Alex Egan was just grand in the sixth smacking a slam to put the contest a way. The Wolves had a dinger of their own as senior Cole Harper tied the game in the third with a three-run shot. Senior Brandon Tallo got things started for the Falcons in the bottom of the first with a single and a pair of stolen bases and scored when Egan reached on an error. Junior Sam Smith was next with a double to score Egan, and Sweeney cleared the bases with a two-run shot giving the Wolves a 4-0 lead. The Loranger bats came alive in the top of the third as senior Luke Colona smacked a double and scored on a single by senior David Smith. Junior BJ Jackson was next with a single and then Harper delivered a home run to plate three and tie the contest at four. The Falcons answered in the bottom half when freshman Ethan Alston walked, stole second and scored on a deep fly ball out by Smith. The Falcons added some insurance in the bottom of the fifth when Tallo scored on an error to make it six to four, but it was six runs in the sixth that put the contest away as senior Jacob Becerra scored on an error and Egan delivered the slam. Senior Kade Bleakley got the win on the mound. He surrendered four runs on six hits over four innings, striking out one and walking one. Sweeney threw three innings in relief out of the bullpen. Bryson Faust took the loss for Loranger. He surrendered six runs on six hits over four and two-thirds innings, walking one. Sophomore Jacob Messina led Loranger with two hits in three at bats. Falcons sweep series with Doyle!. Saint Thomas defeats the Tiger 7-6. The District win marks the 27th in a row without a league loss over the past three seasons. DOYLE, LA—The Saint Thomas Aquinas Falcons rallied from 2-0 down to take a 7-2 lead into the final inning and hung on for the win as Doyle mounted a rally of their own that fell just short. Saint Thomas edges Doyle 4-3 in a hard fought, chippy contest. DOYLE, LA—In a hard fought contest that was chippy at times the Saint Thomas Aquinas Falcons escaped with a 4-3 win over District rival Doyle. Colden Newsom of Doyle and Alex Egan of Saint Thomas battled to a 3-3 tie on the mound through six innings with both defenses playing solid behind them. The Falcons won in the seventh when Egan singled on a 2-1 count, scoring one run and senior Jacob Becerra fielded a fly ball in right by Bradin Kun and threw a frozen rope to junior Bryce Jones at third to convert a double play. The contest saw a couple of big blows exchanged as Colden Newsom hit a dinger for the Tigers and Luke Sweeney smacked a four-bagger for the Falcons. Egan got the win for St. Thomas Aquinas Falcons Varsity. He went six innings, allowing three runs on four hits and striking out 11. Bryce Adams in relief took the loss for Doyle. He went one inning, allowing one run on one hit, striking out one and walking one. Falcons overpower Tigers in 14-0 shutout. Smith and Alston combine for seven hits and four RBIs as Falcon total 16 hits including six extra base hits. Senior Alex Egan smacked a pair of doubles and collected three RBIs. FALCONS secure the DISTRICT CHAMPIONSHIP with the win. HAMMOND, LA—The Saint Thomas Aquinas Falcons brought out the big sticks for their showdown with the Doyle Tigers and smacked 16 hits collecting 14 runs while junior Luke Sweeney and senior Jacob Becerra combined to pitch a shutout. Sweeney worked four one-hit innings and Becerra closed working one. The Doyle Tigers entered the contest in second place chasing the District leading Falcons, but the Falcons slammed the door securing the District Championship improving to 7-0 as the Tigers dropped to 4-3 in the standings being mathematically eliminated from challenging for the title. The Falcons built and early 4-0 advantage over the first three innings, but a nine-run burst in the fourth put it away as Saint Thomas notched seven hits and took advantage of two batters hit by pitch. Becerra, and fellow seniors Champ Artigues and Alex Egan all doubled in the inning, while junior Sam Smith, senior Kade Bleakley, and freshman Ethan Alston all added a single to the fourth inning hit parade. Junior Sam Smith led the hit parade going 4-for-4 with three RBIs, while senior Alex Egan had a pair of doubles and three RBIs, and freshman Ethan Alston went 3-for-3 with an RBI and two runs scored. Becerra finished with two hits along with Bleakley, Artigues and fellow senior Brandon Tallo. The Falcons will square off against the Tigers again today at Doyle. Falcons celebrate Senior Night with 10-0 shutout of French Settlement. Sophomore John Blanchard pitched a complete game shutout scattering one hit and fanning three. HAMMOND, LA—Saint Thomas Aquinas celebrated Senior Night collecting their 101st win in four seasons defeating District rival French Settlement 10-0 to sweep the three-game series and improve to 6-0 in league play. Seniors Champ Artigues, Brandon Tallo, Blaine Jaco, Alex Egan, and Jacob Becerra all had hits as the Falcons notched nine total hits. Tallo and junior Ryan Dawsey led with two hits apiece and Jacob led the team in RBIs with three. Sophomore John Blanchard pitched a complete game shutout scattering one hit and fanning three. The Falcons fresh off a 14-3 romp over the Lions on Thursday made quick work of taming them again scoring five runs in each of the first two innings to all but put the contest on ice. Junior Sam Smith got the Falcons started in the first with a double to score Artigues and Tallo. Freshman Ethan Alston, running for Smith, scored on a pickoff attempt, and Jacob doubled to plate Becerra and Dawsey. Egan got the Falcons going in the second scoring on an error after stealing third. Becerra singled and Alston scored running for Smith. Dawsey doubled scoring Sweeney and Becerra, and Jacob delivered a sac fly to score Dawsey. 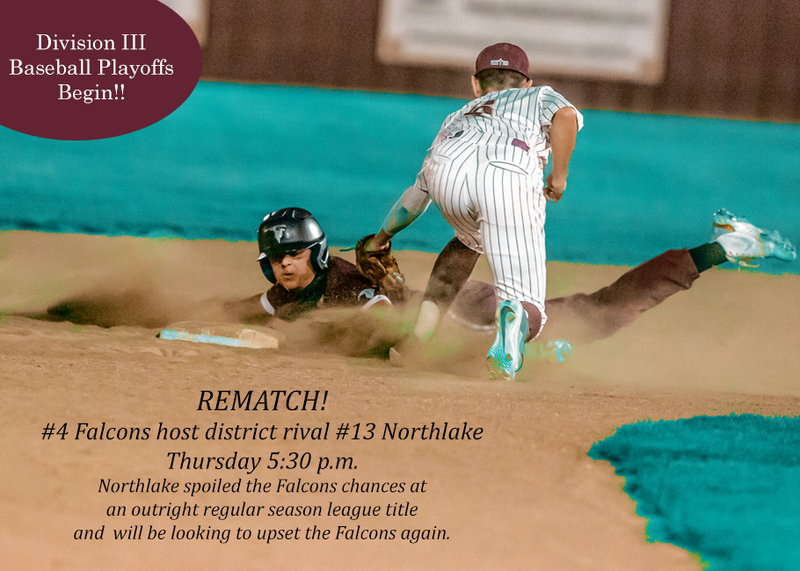 The Falcons will be off this weekend and resume District play Tuesday as they begin a three-game series with Doyle. Falcons bring out the bats to five-run rule the Lions 14-3!! The victory marks the 100 career win for head coach Barrett Morgan. FRENCH SETTLEMENT, LA—Win number one hundred was an impressive one for head coach Barrett Morgan as his Falcons brought out the bats collecting 13 hits and a 14-3 road win over district rival French Settlement. Morgan entered his fourth season at the helm needing 22 wins to reach a hundred career victories and the Falcons reached that goal with their victory over the Lions improving to 5-0 in District play. Senior Kade Bleakley tamed the Lions on the mound pitching a complete game fanning two, issuing no walks, giving up six hits and three runs. Win one hundred saw the Falcon fall behind 2-0 after one inning of play, but quickly took command plating five runs in the top of the second taking the lead for good. The Falcons all but dismissed the Lions in the third inning sending seven more runners home to take a 12-2 advantage. Seniors Alex Egan and Champ Artigues and Luke Sweeney led the Falcon hit parade combining for seven hits and seven RBIs. Egan and Sweeney were sweet on the long ball with each smacking a pair of doubles, and senior Brandon Tallo collected his 24th stolen base. Colin Crane took the loss for French Settlement. He went two innings, allowing two runs on four hits and walking zero. Falcons take game one from the Lions! Sweeney pitches complete game and Dawsey smacks three hits to pace 6-1 victory. Seniors Champs Artigues Brandon Tallo, and Kade Bleakley combine for six hits and five RBIs. HAMMOND—The Saint Thomas Aquinas Falcons took game one of their District series with French Settlement as a pair of juniors led the way. Luke Sweeney pitched complete game and Ryan Dawsey smacked three hits to pace the Falcons 6-1 victory. The win kept the Falcons’ league mark a perfect 4-0. Senior Brandon Tallo got the Falcons off to a quick start in the bottom of the first hitting a double to score fellow senior Champ Artigues who walked. Sweeney helped himself grounding out to score Tallo giving Saint Thomas a 2-0 lead after one. Dawsey singled and scored on a single by Artigues in the second inning. The Falcons padded their margin in the fourth plating two more runs as sophomore Tyler Domiano was hit by a pitch and Dawsey singled. Senior Kade Bleakley was next with a fielder’s choice to advance Domiano to third. Artigues then plated Domiano with a deep sac fly, and Tallo doubled to bring home Bleakley who stole second and third. The Lions got on the board in the top of the fifth as Brice Fruge walked, stole second and scored on a sac fly by Brody Bell. The Falcons answered in the bottom of the sixth when Dawsey collected his third hit and scored on a double by Artigues. Luke Sweeney lasted seven innings, allowing three hits and one run while striking out six. Roman Hodges took the loss for the Lions pitching six inning, allowing nine hits and fanning one. Falcons earn sweep of Bulldogs! HAMMOND—The Saint Thomas Aquinas Falcons hosted District rival Springfield for a double-header Thursday to finish up their three-game league series and had to put on their rally caps to win the first game 4-3 and survive a pitching duel in the second to take a 3-1 victory. A walk-off fielder’s choice led the Falcons past Springfield 4-3 on Thursday. Saint. Thomas Aquinas trailed 3-2 in the bottom of the seventh inning when Matt Kruetzer induced Brandon Tallo to hit into a fielder's choice, but two runs scored as junior Ryan Dawsey and senior Kade Bleakley reached home plate. Dawsey was hit by a pitch to get on base and Bleakley singled. In a pitching duel between senior Alex Egan and Springfield’s Collin Hayden the Falcons managed a 3-1 victory getting more out of six hits while the Bulldogs collected ten. Saint Thomas got the scoring started in the top of the first cashing in a walk by senior Brandon Tallo, who scored on a ground out by junior Sam Smith. The Bulldogs answered in the bottom half plating a run on singles by Keith McKigney and Zach Wild. The Falcons took the lead in the top of the when senior Champ Artigues smacked a triple and Egan singled to bring him home. Saint Thomas added some insurance in the top of the sixth as Artigues cashed in a walk by junior Ryan Dawsey with a double. Egan led the Falcons Falcons on the pitcher’s mound lasting four and a third innings, allowing eight hits and one run while striking out five and walking zero, while Hayden took the loss for Springfield. He lasted six innings, allowing five hits and three runs while striking out three. Smith hits and Falcons win! Junior Sam Smith notched four hits including a pair of doubles to pace a 10-4 win over Springfield. SPRINGFIELD, LA—Sam “THE HIT MAN” Smith paid a visit to Springfield Tuesday night and roughed up the locals with four hits and a 10-4 win over a scrappy Bulldog team. The junior catcher hit a pair of singles and two doubles and collected five RBIs during his visit. Smith got things started in the first inning smacking a single to plate two runs, but the Bulldogs answered in the bottom half cashing in a walk by Ty Moran, who scored on a single by Matt Kruetzer, and a single by Travis Freeman who scored on a passed ball. The two teams traded goose eggs in the second inning, but Smith again got the Falcons going in the top of the third with a lead-off single. Singles by Luke Sweeney and Tyler Domiano advanced Brock Barringer, who ran for Smith, to third and Jacob Becerra grounded out to third base to score Barringer followed by a single by Champ Artigues to score Ryan Dawsey, who ran for Sweeney. Singles by Zach Wild and Kruetzer and ground out by Freeman produced a run for Springfield in the bottom of the third to cut the Falcon lead to 4-3. However, Smith was not finished doubling in the top of the fourth to score Brandon Tallo, who was hit by a pitch and Alex Egan, who reached on a fielder’s choice. The two-run RBI double by Smith gave the Falcons some much needed breathing room and Springfield would only plate one more run before Saint Thomas broke it open for good with three runs in the top of the seventh. The Falcons collected 16 hits total including four extra base hits. Domiano had three hits while the Artigue brothers Champ and Casey each had two hits and Sweeney, who got the win on the mound, helped himself with two hits. Kade Bleakley and Egan each pitched in an inning to get key outs and Becerra closed out the contest retiring the side in the bottom of the seventh. Kruetzer and Freeman led the Bulldogs at the plate with three and two hits respectively and Keith McKigney took the loss on the mound going four innings giving up eight hits and six runs fanning five and walking three. Falcons finish week 3-0 with 10-0 shutout of Albany. Blanchard works six in a two-hitter to get the win. ALBANY, LA—After going 2-2 a week ago, the Falcons stormed back with a 3-0 week finishing it off with a 10-0 shutout of the home-standing Albany Hornets. The Falcons jumped out to a 5-0 lead after just two innings and sophomore John Blanchard kept the Hornet bats quiet giving up just two hits over six innings of work. Junior Sam Smith carried the big stick at the plate with three hits and seniors Brandon Tallo and Alex Egan each added a pair of hits and the trio combined for four RBIs. Junior Luke Sweeney made the most of a double plating two RBIs. Sophomore Tyler Domiano and seniors Champ Artigues and Kade Bleakley all had a hit for the winners. The Falcons added three more stolen bases to their total of 66 with Tallo collecting his 18th on the season. Falcons now wearing a target on their backs ... 20-Game Report. Saint Thomas boasts a 16-4 record after their first 20 games along with a number one 2A Power Ranking and are now the hunted. HAMMOND—Success gets you noticed and it also makes you a target for your competition. For the Falcons, they are indeed a big target after twenty games boasting a 16-4 mark and a top ranking in the Class 2A Power Rankings heading into the start of District play next week when they open against Springfield. Known for good pitching and defense in 2016 when the Falcons won their first State Championship, Saint Thomas has emerged this season with an offensive personality that is rubbing defenses the wrong way. The Falcons are batting .372 as a team and averaging nine hits and nine runs per game. They are also racking up stolen bases with 63. On the mound the Falcons have remained solid led by senior ace Alex Egan. Eight different pitchers have seen action with the team posting a 2.962 ERA and 144 strikeouts. In the field the Falcons have been steady at .960. Head Coach Barrett Morgan is collecting some good numbers as well as he is just six wins away from reaching 100 wins in just his fourth season. Saint Thomas improves to 14-3 with 12-3 victory over Northlake. HAMMOND—After dropping a game to Opelousas Catholic on Wednesday, the Saint Thomas Aquinas Falcons returned to their winning ways in impressive fashion dismissing visiting Northlake Christian 12-3. Senior Jacob Becerra worked four innings to earn the win fanning one and giving up five hits and one run. Six Falcons collected a pair of hits as Saint Thomas finished with 14 including five doubles with senior Kade Bleakley and junior Bryce Jones each notching two double baggers. The Wolverines drew first blood scoring in the top of the first when freshman Josh Dufour singled and scored on a single by junior Cole Bilbo. The lead would be short-lived, however, as the Falcons plated four in the second inning on a groundout by Casey Artigues, a double by Bryce Jones, a groundout by Champ Artigues, and a single by Brandon Tallo. Saint Thomas padded their margin in fourth adding five more runs tallied five runs as. Bleakley, Artigues, senior Brandon Tallo, and junior Sam Smith all contributed in the big inning with RBIs. In all Bleakley, junior Luke Sweeney, Jones, senior Champ Artigues, Becerra, and Tallo all had multiple hits for the winners. Bilbo went 3-for-4 at the plate to lead Northlake Christian in hits. Sophomore Adam Mosher started the game for Northlake Christian. He allowed 13 hits and 12 runs over four and two-thirds innings, striking out one. Playmakers! Falcons play error free baseball to earn 4-1 win over Green Wave! Senior Alex Egan goes the distance fanning seven to earn the win and junior Sam Smith paces the offense with two hits and an RBI. HAMMOND—The Falcons collected their fourth win over teams in the always tough District 6-5A with a 4-1 win over the Ponchatoula Green Wave at The Pat on the campus of Southeastern in action Monday night. Saint Thomas edged Covington in a pre-season scrimmage, and defeated Mandeville and Saint Paul in the regular season. Senior Alex Egan kept the Green Wave bats in check striking out seven and the Falcon defense played error-free baseball behind him. Junior Sam Smith led Saint Thomas at the plate with two hits and one RBI and junior Luke Sweeney make the catch of the night robbing Ponchatoula’s Cameron Stewart of a potential RBI double that turned the momentum. Saint Thomas got on the board first scoring with two out as Egan reached on a dropped third strike. Freshman Ethan Alston ran for Egan and stole second and scored on an RBI single to center field. The Falcons added to their lead in the second as senior Jacob Becerra reached on a single followed by junior Bryce Jones who was hit by a pitch. Freshman Casey Artigues was next and doubled to score Becerra. The Green Wave got on the board in the top of the third when Hunter Bailey singled and advanced to second on a passed ball followed by a double by Logan LaCroix to plate Bailey. In the bottom half the Falcons answered when Egan was hit by a pitch and Alston, running for Egan, scored on a ground out by Sweeney. Ponchatoula made some noise in the top of the fifth as LaCroix singled to centerfield followed by a deep fly ball to the wall in left by Stewart. However, the rally was not to be as Sweeney made the catch at the wall robbing the Wave of a potential run and renewed momentum. “When he squared up, I just saw it right off the bat and got a good jump on it,” said Sweeney. The Falcons tacked on an insurance run in the bottom of the sixth on a sac fly by Champ Artigues that scored junior Ryan Dawsey. Egan faced just five batters in the top of the seventh fanning one and forcing a fly ball out and a ground out. Sweeney’s “RAIN” of terror paces 14-4 win over the Raiders! Saint Thomas collects win number twelve with victory over Pine. HAMMOND—Junior Luke Sweeney unleashed a “RAIN” of terror on the Pine Raiders Friday smacking four hits and collecting four RBIs to pace a 14-4 ten-run rule win by Saint Thomas. Sophomore Tyler Domiano got the win on the mound going five innings, fanning three, walking one and giving up six hits and four runs. A contest played in an off and on rain storm Sweeney gave Pine fits, as he bagged four hits. The junior singled in the second, singled in the third, and singled twice in the fifth. In all, the Falcons had nine hits and took advantage of eight walks and three batters hit by a pitch to notch 14 runs as freshman Casey Artigues ended the game in the bottom of the fifth when he was hit by a pitch with the bases loaded. The Falcons put on a track meet running the bases collecting seven stolen bases including a stolen base by senior Champ Artigues who stole home plate. Senior Alex Egan led the base-running show with a pair of stolen bases. Seniors Brandon Tallo, Jacob Becerra and Alex Egan all had base hits along with junior Bryce Jones, and freshman Casey Artigues. Sweeney got thing started for the Falcons in the bottom of the third when he singled in Egan and freshman Ethan Alston, who ran for Sam Smith who walked. The Artigues brothers notched RBIs in the fourth along with Tallo as the Falcons padded their advantage to 5-0. Pine threatened with a rally in the fifth as Kaden Fersch double in a pair of runs and Ethan Knight blasted a two-run shot to center field. The comeback would be short-lived as the Falcons exploded for nine runs in the bottom half to take the win. Falcons take down 5A fourth-ranked Saint Pauls 10-3! Egan fans a dozen and Artigues smacks a trio of hits. HAMMOND—The hit Falcon parade continued this week as Saint Thomas hosted 5A Saint Pauls and smacked nine hits enroute to a 10-3 win over the visiting Wolves. Senior ace Alex Egan was stellar on the mound working five and a third striking out a dozen Saint Pauls batters. Senior Champ Artigues paced the offense with three hits including a double. The victory was the fifth in a row and improved the Falcons season mark to 11-1. Some first inning defensive heroics by senior Brandon Tallo set the tone for the home-standing Falcons as Tallo robbed a base hit by senior Caleb Lupo to deep center field with one man on to retire the side. The momentum carried over into the bottom half as Saint Thomas junior Luke Sweeney singled to drive in a pair of runs and scored on a passed ball to give the Falcons am early 3-0 advantage and they would hold the lead for the rest of the contest. Egan helped himself in the second smacking a single to score the Artigues brothers. The Falcons padded their margin in the fourth platting three more runs as Tallo and junior Sam Smith all contributed in the big inning with RBIs. Saint Pauls mounted a rally in the top of the top of the sixth as Lupo reached on a dropped strike and William Duncan walked Jacob Scherer who reached on an error to score Lupo and Duncan. The Falcons would answer, however, in the bottom half scoring two as Tyler Domiano grounded out with the bases loaded scoring two. Egan, Sweeney, and Domiano all collected two RBIs. Jacob Boudreaux took the loss for Saint Pauls on the mound giving up five hits and five runs. Senior Jacob Becerra closed out the contest facing just four Saint Pauls batters. The Falcons and Wolves will play again Thursday at Saint Pauls. Falcons and Wildcats put on an offensive show combing for 19 runs. Saint Thomas gets win number ten with a 12-7 victory over East Saint John. Senior Alex Egan goes yard and junior Sam Smith and freshman Casey Artigues collect a pair hits and combine for three RBIs. HAMMOND—The Saint Thomas Aquinas Falcons and East Saint John Wildcats wrapped up their play in the annual Falcon Baseball Tournament on Saturday putting on an offensive show as the two teams combined for 19 hits and 19 runs with the Falcons getting a 12-7 win. The base paths were crowded in this high-scoring affair as the Falcons collected eight hits and East Saint John had 11. Saint Thomas grabbed the early 6-2 lead after two innings scoring on a single by Sam Smith in the first inning, a double by Casey Artigues in the second inning, a double by Champ Artigues in the second inning, and a groundout by Alex Egan in the second inning. After East Saint John scored three runs in the top of the fourth, Saint Thomas answered with three of their own when senior Alex Egan homered on a 1-2 count, scoring three runs. Sophomore Tyler Domiano worked three innings in a no decision and sophomore John Blanchard worked two and two-thirds with senior Jacob Becerra closing out the contest in the top of seventh retiring the side fanning three. Saint Thomas will return to action March 14 and 15 when they play and home and home series with Saint Pauls followed by play in the Livingston Tournament March 16-17. Falcons reach home 18 times in shutout of Saint Martins. Junior Luke Sweeney works four for the win and collects three hits and five RBIs. HAMMOND—The Falcons all but put away the contest in the first three innings plating 13 runs while junior Luke Sweeney worked on a two-hit shutout. Junior Blair Rodrigue finished up the affair in the fifth fanning two and sending the Saints down in order. Caleb Laird took the loss for St. Martin's Episcopal. He lasted one-third of an inning, allowing one hit and one run while walking zero. Sweeney helped his own cause smacking three hits and collecting five RBIs. Senior Champ Artigues had three hits and one RBI while brother Casey had two hits and one RBI. Senior Brandon Tallo also notched a pair of hits and an RBI, and Tyler Domiano had two RBIs. In all, the Falcons has 13 hits which brought their season team total to an even 100. Falcons deliver an impressive rally to defeat 5A Mandeville 9-4! Senior Jacob Becerra collects three RBIs. Sophomore John Blanchard pitches three scoreless innings in relief to earn the win and junior Sam Smith smacks a double to score the go ahead runs. HAMMOND—No matter what team one cheers for everyone loves a good rally and the Saint Thomas Aquinas Falcons delivered one Thursday night to open their play in the annual Falcon Baseball Tournament rallying from four runs down to defeat the 5A Mandeville Skippers 9-4. The Falcons collected six hits including three doubles. Blanchard earned the victory on the pitcher’s mound allowing just one hit and zero runs over three innings, striking out four. Senior Alex Egan closed out the game going one inning striking out the side. Zack Farr took the loss for Mandeville. He lasted four and a third innings, allowing five hits and eight runs while striking out four. Mandeville got things started in the first inning when Charlie Lemmond singled on a 1-1 count, scoring one run and the broke it open with three runs in the third inning as Brandon Mooney and Lemmond each drove in runs during the inning. Saint Thomas answered with four runs in the bottom of the fourth to tie the score. Brandon Tallo led off with a single and stole second. After a ground out Smith was hit by a pitch. Luke Sweeney followed with a line drive double to score Tallo and advance Brock Barringer, who ran for Smith, to third. Jacob Becerra was next with a double to score Barringer and Sweeney. Tyler Dominao was next grounding out to advance Ryan Dawsey to third, who ran for Becerra and then Dawsey scored on a passed ball. Blanchard shut the door on the Skippers in the fifth and sixth innings while the Falcons took command in the fifth plating four runs to take the lead for good. Champ Artigues led off with a walk, Tallo sacrificed but reached on an error, Alex Egan was intentionally walked to load the bases, and Smith delivered a double to score Artigues and Tallo. Sweeney followed with a sac fly to score Egan and Barringer, running for Smith, scored on an error by the catcher. Brandon Tallo, Smith, Tyler Domiano, Jacob Becerra, Champ Artigues, and Luke Sweeney each collected one hit for the winners. Egan and Domiano shine in 2-0 shutout of the Comets! Saint Thomas Aquinas defeats Saint Charles Catholic 2-0. HAMMOND—Senior ace Alex Egan pitched a complete game shutout fanning nine batters and scattering seven hits and sophomore Tyler Domiano provided the offensive punch with two doubles and two RBIs and as the Saint Thomas Aquinas Falcons edged visiting Saint Charles Catholic 2-0. Pitching and defense dominated play as teams were solid in the field paying error-free. The bottom of the fourth inning provided the only offensive fireworks. Senior Brandon Tallo led off with a single followed by Egan who was hit by a pitch. Junior Sam Smith was next reaching on a fielder’s choice as Tallo was thrown out a third. Junior Luke Sweeney singled advancing the runners and after fly ball out, Dominao delivered his heroics with a double scoring junior Brock Barringer, who ran for Egan and freshman Ethan Alston, who ran for Smith. Peyton Broussard went six in the loss giving up two runs, five hits and walking a pair. The 7-1 Falcons will host Zachary on Tuesday and then host their annual tournament Thursday through Saturday. Sweeney dominates on the mound fanning ten to earn shutout win! Saint Thomas Aquinas defeats Catholic of Pointe Coupee 3-0. HAMMOND—Junior right-hander Luke Sweeney pitched seven shutout innings fanning ten Catholic of Pointe Coupee batters as the Saint Thomas Aquinas Falcons won their sixth game in a row with a 3-0 victory. Sweeney helped his caused collecting two hits including a double. Seniors Kade Bleakley and Brandon Tallo each had an RBI and senior Jacob Becerra had two singles and sophomore Tyler Domiano added a double for the winners. The Falcons plated one in the first to take the early lead as senior Champ Artigues singled and advanced to third on a passed ball and scored on a grounder by Tallo. Sweeney doubled to lead off the second and freshman Ethan Alson, running for Sweeney, advanced to second and third on passed balls and scored on a passed ball. Junior Bryce Jones completed the scoring in the inning earning a walk and scoring on a grounder by Bleakley. Falcons plate a dozen runs to record win number five. Saint Thomas Aquinas defeat the Holden Rockets 12-5. HAMMOND—The Saint Thomas Aquinas Falcons got five different pitchers some work as they defeated the visiting Holden Rockets 12-5 to run their record to 5-0. Senior Brandon Tallo pitched two shutout innings fanning two to earn the win, and the Falcon offense collected 11 hits including four doubles and a triple to plate a dozen runs. Seniors Champ Artigues, Jacob Becerra, and Brandon Tallo all had two hits along with juniors Sam Smith and Luke Sweeney. Becerra notched three RBIs while Artigues and junior Bryce Jones each had two. The Falcons started fast posting a four spot in the bottom of the first as Tallo hit a single with one out followed by a walk by senior Alex Egan. Tallo stole third and scored on a passed ball and Sweeney was hit by a pitch to get on base and advanced to second on a passed ball. Becerra followed delivering a triple to score Egan and Sweeney and then Becerra scored on a passed ball. Doubles by Artigues and Jones sparked another four-run rally in the sixth that put the contest away. Sophomore John Blanchard shut the door on the Rockets in the top of the seventh recording a pair of strikeouts and forcing a pop up. Falcons off to one of their best starts. Saint Thomas making some nose at the plate to start the season. HAMMOND—While the season has just started and the bulk of the schedule lays ahead, the Saint Thomas Falcons, for now, are off to one of their best starts. The Falcons are 4-0 and have put up 55 runs and notched 44 hits including 14 extra base hits and collected 45 RBIs. As a team Saint Thomas is batting .419 with a slugging percentage of .571. Base running has been a plus early with the Falcons notching 15 stolen bases and defense has been solid with Saint Thomas only giving up a pair of errors and posting a .977 fielding average. On the mound, the Falcons has used five pitchers so far and they have combined for 30 strikeouts and a team ERA of 2.800. The Falcons return to action Tuesday hosting the Holden Rockets in a non-district contest at Austin Brooks. Falcons make the most of seven hits. Saint Thomas Aquinas wins fourth in a row with 7-4 win over visiting Lakeshore. Becerra collects two hits and an RBI and Jones dazzles on defense to close out the game. HAMMOND—The Falcons got a lot out of a little and manufactured a 7-4 win over the visiting 4A Lakeshore Titans in action Saturday. Saint Thomas made the most of seven hits and got a complete game pitching performance from senior ace Alex Egan to earn their fourth win in a row. The Titans did not go down easily taking the lead in first inning as Devin Weibaecher drove in two runs when he singled. The Falcon answered in the bottom of the second when sophomore Tyler Dominao singled to lead off and junior Luke Sweeney reached on an error. Domiano was caught stealing but junior Sam Smith walked followed by a double by Jacob Becerra to score Sweeney. Junior Bryce Jones was next with a sacrifice scoring Ethan Alston who ran for Smith. Saint Thomas took the lead in the third as senior Brandon Tallo singled and Egan doubled followed by sacrifices by Domino and Sweeney. Lakeshore got a single and a double in the top of the fifth to tie the game at four all, but the Falcons answered with three runs in the bottom of the sixth to take the lead for good. After a ground out by Sweeney, Smith walked followed by a single by Becerra and a single by Jones to score senior Kade Bleakley who ran for Smith. Alston grounded safely into a fielder’s choice scoring Becerra and after Alston stole second, senior Champ Artigues singled to score Alston. Jones almost single-handily closed out the game for the Falcons in the top of the seventh making a circus catch against the left-field fence for an out and then robbing the Titans of a base hit down the line for the second out. Alston collected the third out catching a pop up. Becerra led the Falcons with two hits and an RBI and Egan struck out six and walked two in getting the complete game win on the mound. Falcons make it three in a row with 18-5 win over Walker. Senior Champ Artigues collects five RBIs and his second dinger on the season. WALKER, LA—“… and the hits just keep on coming …” the Saint Thomas Aquinas Falcons continued their dominance at the plate racking up 16 hits and 18 runs as they notched their third win in a row defeating Walker. Sophomore Tyler Dominao earned the win working four innings striking out four and helped himself at the plate with three hits and two RBIs. Seniors Brandon Tallo, Jacob Becerra, junior Bryce Jones, and freshman Casey Artigues all collected two hits and combined for six RBIs. The Falcons wasted no time breaking the contest open scoring 12 runs in the first two innings and cruising to their second ten-run rule win in two days. The Falcons have plated 48 runs in their first three games of the season and totaled 38 hits including a pair of dingers and done it all on the road. Falcons ten-run rule the Jags 11-1! Sophomore John Blanchard pitches a complete game to earn the win. Smith and Artigues lead hit parade. SLIDELL, LA—The Saint Thomas Falcons continued their offensive road show Thursday night rallying from a slow start to put away the home-standing Pope John Paul II Jaguars 11-1 in six innings. Sophomore John Blanchard was impressive on the mound fanning nine and giving up just three hits and one run. Junior catcher Sam Smith led the Falcon hit parade with three hits and three RBIs while senior Champ Artigues collected a dinger. The Falcons trailed early 1-0 and nursed a 3-1 lead after four innings, but broke it open in the top of the fifth plating five runs as Artigues led off with a dinger over the right field fence. Senior Brandon Tallo was next with a single, followed by senior Alex Egan who was hit by a pitch. Sweeney then delivered a sac bunt to move the runners over. Tyler Domiano singled to score Tallo and Smith doubled to score Egan. Senior Jacob Becerra followed with a sac fly to score Domiano and Smith scored on a Jaguar error. Saint Thomas extended their margin to ten in the sixth scoring three more runs as freshman Casey Artigues stole home and Smith singled scoring Domiano and junior Brock Barringer. Falcons continue their offensive show plating 19 runs in opening day win over North Vermilion. Senior Brandon Tallo and freshman Ethan Alston combine for five hits and six RBIs. MAURICE, LA—Fresh off scoring 17 runs in the Mandeville Jamboree, the Saint Thomas Aquinas Falcons continued their offensive show collection 19 runs in their opening day road win over the North Vermilion Patriots who scored five. Senior ace Alex Egan got the win working five innings and fanning ten. Senior Brandon Tallo led the Falcon hit parade with three hits and three RBIs while freshman Ethan Alston had three RBIs on two hits. Senior Champ Artigues and freshman brother Casey each had two hits and Egan had two. The Falcons plated six runs in the first two innings and padded their margin in the sixth with seven as Alston , Tallo, Egan, Blaine Jacob, John and Blanchardall drove in runs in the frame. Saint Thomas notched 13 hits total including seven doubles. Dylan Gaspard was credited with the loss allowing seven hits and six runs. The Falcons will stay on the road this week as they compete in the Northshore Tournament set for February 22-24. Falcons collect 17 runs in a pair of three inning scrimmages. Saint Thomas impresses in Mandeville Jamboree with an 8-1 win over Pearl River and a 9-0 win over Northlake. Blanchard fans six in no hitter against Northlake. HAMMOND—The Saint Thomas Aquinas Falcons made the most of a pair of three inning Jamboree games collecting a total of 17 runs as they defeated Pearl River 8-1 and Northlake Christian 9-0 in the annual Mandeville Skipper Jam. The Falcons put on an offensive show with seniors Champ Artigues and Alex Egan leading the hit parade. On the mound, sophomore John Blanchard pitched a no-hitter to shutout the Wolverines of Northlake. With the pre-season tune-ups complete the Falcons will spend opening day on the road as they take on North Vermillion at 5:00 p.m. on Monday. The 2018 Falcons are getting back to basics with an eye on personal and team development. HAMMOND—After winning 78 games, back-to-back District Championships and a LHSAA Class 2A State Championship over the past three years, one would conclude that the state of Saint Thomas Aquinas Baseball is in good hands and in good shape. But after a first round loss in the playoffs last season despite winning 25 regular season games, head coach Barrett Morgan and his 2018 Falcons believe they have a lot work to do to get better. The Falcons earned the number three seed last season but saw their season end in the first round at the hands of the number 14 seed, Dunham, losing 2-1 in the three game playoff. The Falcons will play a trio of scrimmages and in the Mandeville Jamboree as a tune-up and the regular season starts February 19 when the Falcons hit the road to play North Vermillion. Back-to-Back District Champions dominate All-District selections. Egan named MVP and Morgan Coach of the Year. HAMMOND—With victory comes rewards and the Saint Thomas Falcons (25-7, 9-0), champions of District 9-2A for the second year in a row, dominated the 2017 All-District team earning six first team and six second team selections as Saint Thomas junior ace, Alex Egan, was named District MVP and Falcon skipper Barrett Morgan was named Coach of the Year. The Springfield Bulldogs, the District runner-up (13-14, 4-5) placed four first teamers on the squad and three second teamers. Egan finished with perfect 4-0 mark in District on the mound and 8-1 overall. The junior right-hander also helped himself at the plate batting .341 on the season with three home runs and 29 RBIs. Senior Trey Milazzo was also perfect for the Falcons going 3-0 in District play while collecting 26 RBIs and notching a grand slam. Junior Matt Kreutzer led the Bulldogs on the mound with a 2-2 league mark and 5-3 overall while batting .423, while his catcher junior Ty Moran joined him on the first team batting .393. French Settlement’s (19-11, 3-6) Remy Watts rounded out the first team selections going 1-1 in District and 8-2 overall with a 1.88 ERA as the Lions finished third in the standings. In the field, the Falcons earned four first team spots. Senior Donny Roberts at first base batting .556 in District with one homer and 16 RBIs overall, junior Champ Artigues at short stop batting .454 with 24 RBIs overall and 11 extra base hits including three triples, junior center fielder Brandon Tallo batting .364 in league play with 11 RBIs, and junior right fielder Jacob Becerra hitting .333 collecting 16 RBIs overall and five extra base hits. For Springfield, Brit Harris was selected first team second-sacker with a fielding average of 1.000 while collecting 10 RBIs. Bulldog junior Travis Freeman earned first team outfield selection batting .321, while teammate Keith Mckigney earned utility player selection with a .394 average at the plate and also a 2-2 mark on the mound. The Lions had three first team utility player selections including junior Bryant Johnson batting .250 while going 2-3 on the mound, senior Micah Champagne hitting 2.84 with 16 RBIs and 29 runs scored, and Cameron Guitreau batting .357 while notching a 4-3 record over all on the mound. The Doyle Tigers were represented on the first team by juniors Colten Newson, who averaged .462 at the plate, and Trenton Mizell, who finished with a .320 average. The second team pitch staff included sophomore Brice Fruge of French Settlement, junior Kade Bleakley of Saint Thomas, sophomore Blair Rodrigue of Saint Thomas, and sophomore Kendall Stanga	of Springfield. Behind the plate Sam Smith was name second team catcher. Second team selections around the bases were eighth-grader Tyson Stewart of Doyle, sophomore Bryce Jones of Saint Thomas at second, sophomore Mason Davis of Doyle at short stop, and sophomore Luke Sweeney of Saint Thomas at third. In the field on the second team were junior Kyle Welda, junior Brant Smiley of French Settlment, senior Kyle King of Saint Thomas, and junior Brennan Vittoria of Springfield. Utility selections includes junor Tristan Jones of Doyle, senior Jackson LeBourgeois of French Settlement, senior Brannon Long of French Settlement, and senior Micah Crittenden of Springfield. Honorable Mention honors were given to freshman Jonas LeBourgeois of French Settlement, senior Collin Forbes of French Settlement, sophomore Cole Mack of Doyle, junior Wyatt Bankston of Doyle and eighth-grader Cade Watts of Doyle. Saint Thomas holds serve in game one with 4-1 win over Dunham. Falcons get clutch hits and big pitches to secure win. HAMMOND—The Saint Thomas Aquinas Falcons broke the hearts of a determined Dunham team with a clutch hitting and big pitches as they opened their playoff series with the visiting Tigers with a 4-1 victory. Junior right-hander Alex Egan worked out of a jam in the top of the fifth fanning two batters to strand two Tiger base-runners at second and third, and junior Champ Artigues and senior Donny Roberts delivered big hits in the fifth and sixth innings to break open a tight contest. “We played this team two months ago and today that was not the same team—they came to play and hats off to them for a solid performance,” said Saint Thomas head coach Barrett Morgan. Egan and Dunham lefty Ryan Erwin each faced just three batters in the first inning before the sides were retired, but in the second, the Falcons plated one as sophomore Luke Sweeney hit a one-out single and scored from third on a throwing error. The two teams traded goose eggs in the third and fourth innings as sophomore catcher Sam Smith gunned down a Tiger attempt to steal second base to retire the side and Dunham returned the favor in the bottom half spoiling a potential Falcon scoring burst with a double play that stranded two Saint Thomas base-runners. The fifth inning proved to be the game breaker as Egan worked of jam fanning two Dunham batters with runners on second and third to deny the Tigers a chance to tie or go ahead. The Falcon offense made the Tigers pay for a missed opportunity as Roberts led off with a single followed by junior Jacob Becerra who reached on an error. Junior Troy Tallo was next delivering a near perfect bunt to move the runners into scoring position and Artigues cashed it all in with a triple to score Roberts and Becerra giving the Falcons a 3-1 advantage and some much needed breathing room. The Tigers got one back in the top of the sixth as Chris Coleman walked and scored on a double by Erik Semien, but the Falcons answered in the bottom half as Roberts delivered a two-out double to plate Kade Bleakley who ran for Egan. Egan led off the inning with a single. Egan finished the contest in impressive fashion in the top of the seventh forcing a ground ball to second and the fanning the next two Tiger batters. The Falcons finished with seven hits as Roberts led with two and Artigues, Egan, Tallo, Sweeney, and King all had one for the winners. Falcons start second season hosting the Dunham Tigers. New playoff format features 16 teams. HAMMOND—The second season starts Friday as the Falcons play host to the Dunham Tigers in a best out of three series. With the new playoff format dividing select and non-select schools Saint Thomas will compete in Division III which has a 16 team bracket and starts with Regionals. The Tigers finished the season 19-13 and earned runner-up honors in district play and are the number fourteen seed. The Falcons and the Tigers met this season in tournament play back in early March with junior Kade Bleakley pitching as Saint Thomas collected a 12-2 victory. The Falcons collected 14 hits getting out to an early 5-0 first inning lead and cruising to a ten-rule win. They have also played a common opponent this season in Doyle with the Tigers winning a pair and Saint Thomas a trio of games over Doyle. The Tigers have a team batting average of .275 and are led at the plate by Erik Semien with a .400 average and .467 on base percentage followed by Juwan Fitch batting .343 and Nick Harris and Benton Davis each batting .333. Harris leads the team in going yard with two homers. On the mound Benton leads Dunham with a 2.01 ERA followed by Ryan Erwin at 3.00. Dunham finished 9-21 last season and did not qualify for the playoffs. The Tigers have five final four apperances and two state final appearances. They won the Class 2A title in 1987 and last reached the final four in 2012. Falcons outlast Wolves to win final regular season game 5-4. Saint Thomas rallies from from four down after three innings to secure win. Rodrigue delivers another solid relief performance. Playoff pairings to be announced Sunday, April 23. LORANGER, LA—The Saint Thomas Aquinas Falcons had to pull out their rally caps Saturday after they fell behind 4-0 to the home-standing Loranger Wolves. Loranger took an early lead after the first three innings of play, but the Falcons scored five unanswered and got another game saving relief performance from sophomore Blair Rodrigue who worked the final two innings. The Falcons collected nine hits on the day, but committed four errors. The Wolves used a lead-off walk by senior Travis Lamb in bottom of the first to get their fast start. Lamb reached second on a sacrifice by junior Jonathan Matherne and scored on a wild pitch after reaching third on a ground out by senior Quinlen Willie. In the second inning, Loranger cashed in singles by Tanner Beyl and Lamb along with a Falcon error to plate three more runs. Lamb laid down the big hit to collect a pair of RBIs. The Falcons cut the Loranger lead in half in the top of the third as junior Champ Artigues walked and scored on a double by senior Kyle King followed by a single by senior Trey Milazzo sending King to third. Junior Alex Egan was next with a sac fly to right to plate King. After trading goose eggs with Loranger in the fourth, the Falcons added another run when Artigues cashed in a lead-off single in the top of the fifth coming home on a sac fly by Egan. Saint Thomas completed their comeback in the top of the seventh collecting four hits to plate two runs and take the lead for good. King led off with a single followed by a one out double by Egan to score King. Junior Luke Sweeney worked the count for a walk followed by a single by sophomore Sam Smith as Egan advanced to third. Senior Donny Roberts was next with a single to score Egan. Rodrigue faced only four Loranger batters in the bottom half collecting the three outs and saving the 5-4 win. Saint Thomas finishes District 9-2A play with a perfect 9-0 mark for the second year in a row with 11-2 win over Doyle. DOYLE, LA—The Saint Thomas Aquinas Falcons finished up their business in District 9-2A play Thursday with an 11-2 romp over the Doyle Tigers completing a perfect 9-0 mark for the second year in a row. The victory also marked a milestone for head coach Barrett Morgan as he reached 75 wins in just his third season as the skipper. The Falcons will practice Friday and play their final regular season contest at Loranger on Saturday. The Falcons collected 14 hits as four different players had two hits. Juniors Champ Artigues, Jacob Becerra, and Alex Egan all had a pair of hits. Trey Milazzo fresh off a grand slam on Tuesday worked the mound for Saint Thomas going six innings for the win. The senior right-hander fanned five, walked one, allowed two runs, and helped himself with a pair of hits and two RBIs. Sophomore Blair Rodrigue worked the final inning forcing three fly balls to close it out. Seniors rally Falcons past rival Doyle 7-3 as Milazzo delivers a walk-off grand slam, Roberts ties the game with an RBI double, and King lays down a bunt single to load the bases setting up Milazzo's heroics. HAMMOND—It is the bottom of the final inning. The score is tied. The bases are loaded and you come up to bat. Anxious teammates and fans are watching and hoping and some are even biting their nails. It is your last regular season game as a high school senior. You swing and miss—strike one. The next pitch is a ball and the one after that. You take a deep breath and lock in. Now you are ready. You swing the bat and hear the familiar crack as the ball makes contact. It feels right and you glance right and as you step toward first base you hear the screams and cheers of your teammates and fans who know it is a home run before you do …. Is this the fantasy of a ten year old boy in his backyard telling his friends what he going do one day? No. For senior Trey Milazzo and the Saint Thomas Aquinas Falcons this is no fantasy. In action Tuesday night at Austin Brooks Field on the campus of STA, Milazzo broke a 3-3 tie with the visiting Doyle Tigers in the bottom of the seventh on Senior Night smacking grand slam over the right field fence to complete a come-from-behind rally by the Falcons. The 7-3 District 9-2A win improved the Falcons District mark to 8-0 and was the tenth win in a row for Saint Thomas Aquinas. “I really like us at the plate right now from top to bottom, but it seems like this year in a number of games we have been having good at bats but we were hitting the ball right at people,” continued Morgan. Saint Thomas Aquinas and Doyle have become known for playing nail-biting contests with dramatic endings in recent years. In 2015 the two squads needed 17 innings to decide a winner as Doyle took a 2-1 victory. The Falcons and Tigers will get another chance for more drama this season as they meet again on Thursday to finish up District play. The Falcons rallied from 3-1 down to tie the contest going into the seventh and after starting pitcher junior Alex Egan walked one Doyle batter and fanned three, Saint Thomas completed their comeback as junior Brandon Tallo led off and was hit by a pitch, followed by junior Champ Artigues who walked, and senior Kyle King who reach on a bunt single to load the bases. Milazzo was next ending the contest with a walk-off grand slam clearing the bases for a 7-3 Falcon victory. “Whether we won or lost and certainly I am glad we won, we needed a game like this late in the season where we had to grind it out and face a lot pressure,” added Morgan. After yielding a pair of outs in the top of the first, Doyle came out hitting as sophomore Cole Mack doubled followed by a walk by junior Tenton Mizell and then a single by junior Colten Newsom that scored Mack and Mizell. Saint Thomas got one back in the bottom half when Artigues was hit by a pitch, advanced to second on a sac bunt by King, and scored on a single by Egan. Egan faced only four Doyle batters in the top of second and sophomore Kolt Mitchell send the Falcons down in order in the bottom half with the help of a double play. The Tigers would prove stellar in the field finishing the contest with zero errors. Doyle padded their advantage in the top of the third with one swing of the bat as Newsom smacked a bomb over the big wall in center field putting the Tigers up 3-1. The Falcons would have to wait until the bottom of the fifth to cut into the Tiger lead as the Doyle defense frustrated the Saint Thomas offense robbing a pair of base hits with diving catches in the outfield. Tallo worked the count for a lead-off walk and advanced to second when Artigues was hit by a pitch, and reached home on a sac fly by Milazzo that cut the Tiger lead to 3-2. Senior Donny Roberts provided his Senior Night heroics in the bottom of the sixth to tie the score as he doubled to score sophomore Sam Smith, and Egan set the stage for Milazzo’s heroics in the bottom of the seventh as he faced only four Doyle batters in the top of the seventh walking one and fanning three. Egan would finish with a dozen strikeouts, walking three and giving up six hits. The Falcon seniors made the most of their Senior Night as the trio all had hits. Milazzo led with one dinger and a sac fly to collect five RBI, while Roberts doubled with an RBI and King laid down a bunt single to load the bases setting up Miliazzo’s slam. Newsom led Doyle with two hits and three RBIs, while junior Kyle Welda also had a pair of hits. Sophomore Blair Rodrigue quiets Northlake bats to end Wolverine rally as Falcons go on to collect a 13-3 win. COVINGTON—The Saint Thomas Aquinas Falcons got a welcome relief from sophomore Blair Rodrigue as the Northlake Wolverines were poised to rally into the lead in the bottom of the third with the score 5-3 and the bases loaded. The sophomore lefty took over from senior Donny Roberts, who relieved starter Kade Bleakley, with two outs and retired the side and then worked three more scoreless innings as the Falcon bats came alive and rolled to a 13-3 win. “Blair (Rodrigue) does a good job of keeping the ball down and around the plate and that gives our defense a chance to make plays behind him,” said Saint Thomas head coach Barrett Morgan. The sophomore tossed three and a third innings, allowing zero runs, two hits, striking out two, and walked zero. The Falcons took the early first inning lead when Alex Egan doubled with two outs in the first inning scoring junior Champ Artigues who singled. The Wolverines tied it in the bottom half when senior Diego Sanchez singled and scored freshman Jake Nunmaker. Saint Thomas surged ahead in the second inning plating four runs as junior Jacob Becerra doubled and scored sophomore Sam Smith, Artigues walked and senior Kyle King singled and Milazzo hit a too hard to handle ball to short and combined with a Wolverine throwing error scored Becerra, Artigues, and King. The Wolverines rallied in the bottom of the third as senior Buddy Kyle was hit by a pitch and scored on a bases loaded walk by freshman Carson Orellana and sophomore Cole Bilbo singled and scored on a bases loaded walk by junior Cooper Moore. With two outs and the bases still loaded after a pair of walks issued by Roberts, who replaced Bleakley, Rodrigue took over and retired the side striking out junior Dale Dufrene to end the Northlake rally. The Saint Thomas offense responded in the top of the fourth and all but put the contest away as they plated five runs to extend their advantage to 10-3 giving Rodrigue some much needed cushion. Becerra and junior Brandon Tallo hit back-to-back singles followed by a walk by Artigues to start the inning. Milazzo hit a sac fly to score Becerra followed by a single by Egan to score Tallo. Sophomore Luke Sweeney was next with a double to score Artigues and Egan and Sweeney scored on a single by Smith and a Northlake throwing error. King delivered some final fireworks in the top of the fifth as he hit an inside the park home run scoring Artigues who walked. The Falcons added a run in the sixth to invoke the ten-run rule as Sweeney doubled and advanced to third on a single by freshman Matt Linn and scored on a bases loaded walk by Tallo. The Falcons collected 13 hits with King, Sweeney, and Egan each notching two. Milazzo led with three RBIs while King, Sweeney, and Egan each had two. The Wolverines had six hits and junior John Macaluso was credited with the loss. Saint Thomas will return to District play Tuesday hosting the Doyle Tigers on Senior Night and finish up with the Tigers on Thursday at Doyle. The Falcons wrapped up the District Championship last with a pair of wins over French Settlement. Following the Doyle series the Falcons will finish the season at Loranger. Luke Sweeney ... Perfect Game Winner.